On March 24, U.S. Secretary Ben Carson and Florida Governor Rick Scott joined Habitat for Humanity International CEO Jonathan Reckford and Habitat Broward to celebrate A Rick Case Habitat Community, scheduled to start home construction in early 2018. The event also marked the beginning of the largest community Habitat Broward will build to serve 77 Broward County families in need of safe, affordable homes. Secretary Carson stressed the need to forge public and private partnerships like Habitat Broward is doing, uniting individuals and corporations, Broward County government, schools, the sheriff’s office and the City of Pompano Beach around the common goal to provide affordable housing for our working families. “What’s truly delightful here is that you have so many people coming together to create something that works,” Carson said. More than 200 invited guests attended the event at Hopewell Missionary Baptist Church in Pompano Beach. Joining them were guest speakers Rita and Rick Case, Governor Rick Scott, former U.S. Senator George LeMieux, Sheriff Scott Israel and Superintendent of Broward County Schools Robert Runcie. 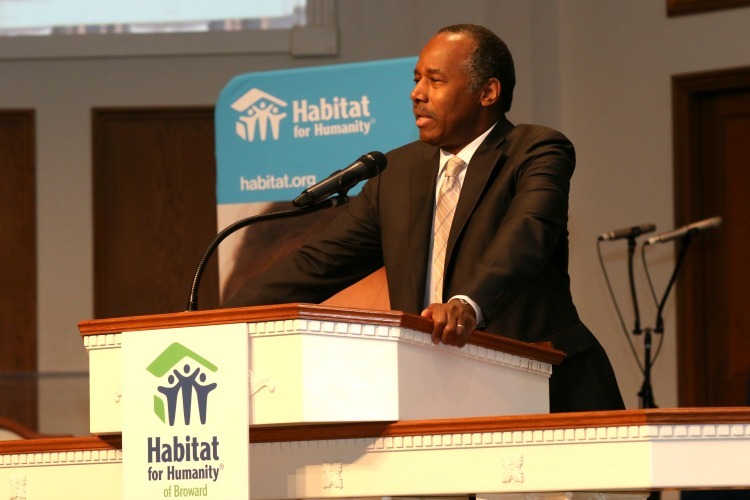 This extraordinary event was one of the first stops on Secretary Ben Carson’s listening tour in preparation for his role at the Department of Housing and Urban Development (HUD). Habitat Broward sees its role to elevate the conversation on affordable housing as critical. Broward County is the most cost-burdened housing market in the nation and the gap between earnings and housing continues to widen. That is why the new Rick Case Habitat Community, sitting on 9 acres in Pompano Beach, is such an historic initiative. Seventy-seven Broward County families’ lives will be transformed as their opportunities to enjoy better education and health care, financial stability, a sense of community and belonging and safer, happier futures are made possible through homeownership. For more information on how you can be a partner in A Rick Case Habitat Community, please contact Barbara Witte, Director of Development & Marketing at (954) 396-3030 x211. Volunteers needed to answer phones at the Habitat ReStore! The Habitat ReStore needs your help! Volunteers are needed to answer the phones Monday-Friday 9:30-6, and Saturday 8-6. Due to the training and orientation involved, along with the fact that it takes a few days to truly learn everything, we are asking for a once per week volunteer commitment for at least 3 months. Contact Eliot at eliot@habitatbroward.org (954) 396-3030 ext. 210 for more information, or to set up a training/orientation date. The Habitat ReStore is a critical part of Habitat Broward so by supporting the ReStore, you’re helping us to provide more homes to more families in Broward County. https://www.habitatbroward.org/wp-content/uploads/2017/10/HHB_menu_logo_lg.png 0 0 Denyse Peterson https://www.habitatbroward.org/wp-content/uploads/2017/10/HHB_menu_logo_lg.png Denyse Peterson2012-12-05 21:40:592013-02-05 21:42:00Volunteers needed to answer phones at the Habitat ReStore! A group of South Florida women came together to build something amazing for those in need. Dozens of women, donned in pink, took part in Habitat for Humanity of Broward County’s Women Build, Saturday. The women helped build several homes in the Fort Lauderdale area. Auto Nation, Marti Huizenga and the Seminole Hardrock Hotel and Casino were some of the sponsors of the homes. “This is my first build and I’m looking forward to not screwing anything up,” said Susan Renneisen of the Seminole Hardrock Hotel and Casino. After working throughout the day, the ladies grabbed a bite from Publix and relaxed under their pink tent. If you would like to volunteer with Habitat for Humanity in Miami-Dade and Broward Counties, visit the websites linked above. Channel 7 is a proud sponsor of Habitat for Humanity. [blockquote align=”left” cite=”The Nonprofit Quarterly – Rick Cohen”]This must be the nonprofit sector’s least-publicized major accomplishment. Everyone who reads NPQ Newswire knows about Habitat for Humanity (we have written about Habitat numerous times, here and here and here and here and here, for starters, and there will be a long article on Habitat in the forthcoming Fall 2011 issue of The Nonprofit Quarterly magazine). The image many people have is of a local Habitat organization, mostly faith-based volunteers, building a few homes a year for poor people, putting in sweat and tithing to provide a small number of families an opportunity to be homeowners. But did you know that on World Habitat Day (October 3, as designated by UN-HABITAT, a United Nations organization not connected to Habitat for Humanity) in Maai Mahiu, Kenya, Habitat will celebrate the dedication of its 500,000th house? (On this same day it will also begin construction on its 500,001st house—in Paterson, New Jersey.) Did you know that Habitat dedicated its 200,000th house in 2005, so this latest milestone represents more than a doubling of Habitat’s worldwide lifetime production in only six years?